Three women have changed the way we think about non-human beings, one of them is Dr. Jane Goodall. Her studies in Gombe, Tanzania, have led to many more research findings, have set the path for intrinsic, inspiring, advanced, and expansive investigations of previous “knowledge” and “beliefs” on hominids in general and chimpanzees in particular. “There have been many remarkable discoveries made by animal researchers over the years, but Gombe is where Dr. Jane Goodall made perhaps the most amazing finding of all; a discovery that didn’t just change how humans think about chimpanzees, but changed the way humans think about ourselves. When a young Jane Goodall first entered the dark forests of Gombe in what is now Tanzania, there was a common consensus among the scientific community that humans were the only animals with the cognitive capacity to use tools. However, all of that changed on one afternoon in 1960, when Dr. Goodall decided to watch one of her favorite chimpanzees, David Greybeard, hunt for termites. 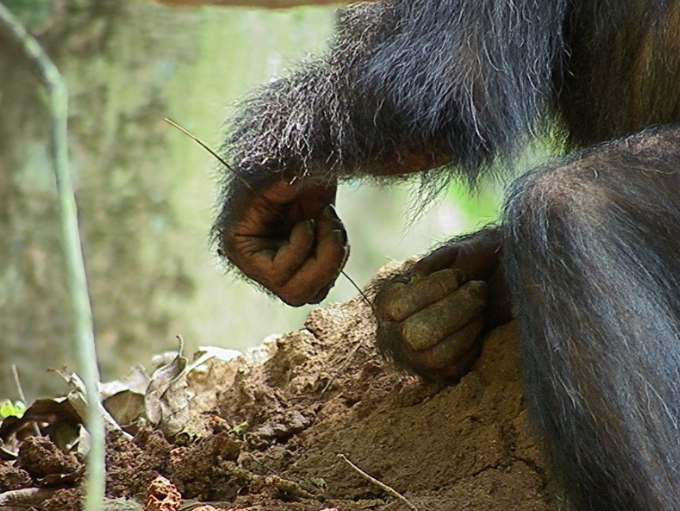 While watching the large male chimpanzee forage around a termite mound, she noticed him picking long pieces of grass, sticking them into the mound, then pulling them out and licking them. Curious, Jane approached the termite mound once David Greybeard wandered off and discovered that David had been ‘fishing’ for termites, lowering the blade of grass into the mound and then pulling it out once termites had bitten it!